A fantastically witty and smart movie about the final high school year for a girl who is trying to figure things out about her life. This is a movie about a girl who is constant defiance and struggle to figure things out about herself. Lady Bird is a girl who has given herself this name and tried very hard to be her own person, despite forces such as her mother, which seem determined to hold her back. The movie is about Lady Bird’s final year of school, which basically takes us through two semesters of halves of the film. The first half is about the good boy she dates, the nice wholesome friend she has, and joining the school play. 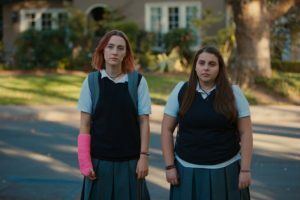 The second half is about the bad boy, the rebellious girl who becomes her new cool friend, and how Lady Bird finds herself starting to become someone she’s not. And the story that runs throughout the film, alongside these others, is about Lady Bird and her parents. Lady Bird is trying to figure out where to go to college next year, and he parents stand on opposite sides of this issue. Her mom wants her to stay local, but her father is open to letting Lady Bird decide for herself. They represent one more two sided situation, (just like the two halves of the film, and crowds she hangs out with,) and one more conflict that Lady Bird must deal with and figure out. It all makes for a witty black comedy and a very smart film. Lady Bird is a great movie. In a time when it would seem that we’ve seen every high school situation under the sun, (witness the movie The Edge of Seventeen, and how it is basically just another take of one part from the movie Election,) it’s refreshing to find something that is actually new. But this movie is it. This movie chronicles the experience of a rebellious girl who might pretend that she doesn’t care what people think of her, but actually cares quite a lot. That’s why she spends the movie transforming herself as she goes after different guys, finds different friends, and deals with multiple issues and arguments with her mom. The movie opens with that scene from the trailer where Lady Bird and her mother, (played by Laurie Metcalf,) are in a car listening to the end of the book on tape, and then break into an argument, before Lady Bird jumps out of the car. What a way for the movie to get our attention early on. We go from here to seeing her pink cast, where she has cursed out her mom in writing. And we start to meet Lady Bird’s friend, Julie, who is an outcast, just like her. These girls are somewhere in between the goodies and the baddies. They don’t do anything criminal or outrageous, but at the same time, they do steal the Church wafers and sit around eating them, while another girl condemns their behavior. There girls are both from the same walk of life, meaning they don’t really have money, and live on “the wrong side of the tracks,” an expression that actually comes up a lot in this movie. It comes up because that’s what Lady Bird says about herself, and where she lives, but as Danny, a boy she dates, (Lucas Hedges,) points out, it is actually true. There really are, literally, tracks. This comment also gets Lady Bird in hot water with her parents later on, when her mother reveals to her how much it hurt her father. One thing nice is that there’s no real jealousy here. Sure, Lady Bird wishes it was her who got that part, and might make one quick comment to that effect, but she and Julie remain friends, and there’s no resentment. A lesser movie might have made jealousy a huge plot point, but this is actually a smarter and more mature film. Lady Bird dates Danny and doesn’t really fear Julie at all in that area, (for one thing, Julie has a massive crush on their math teacher.) Everything seems to be going great until Lady Bird learns something about Danny that turns out to be a game changer. And that kind of spirals her into the second half of the movie. The bad girl half. If the first half was about being the good girl, joining the school play, and dating this nice wholesome boy, then the second half is the exact opposite. And what’s fantastic is that elements from the story in the first half come back in some important ways in the second half. For example, there’s this big blue house that Lady Bird is in love with. It’s in a neighborhood not too far from hers, but is about four times the size of her house. When she walks by with Julie, she talks about how this is her favorite house in the area. Well, it turns out this is Danny’s grandmother’s house, and Lady Bird gets invited there for Thanksgiving. And in the second half, when she is no longer with Danny, Lady Bird pretends the house is hers, and lies about it, and this ends up getting her into a bit of trouble. The second half is where Lady Bird develops a crush on a new guy, and changes who she is in order to win this guy over. The new boy is Kyle, and unlike Danny, Kyle is a bad boy. Played by Timothee Chalamet, Kyle is a total anarchist who refuses to give anything back to society. He says he tries to stay away from money, because he doesn’t want to put anything into the economy, rolls his own cigarettes, because he doesn’t want to buy any product, and insists that cell phones are actually government tracking devices. We’ve all known people like this, who are so sure of themselves, and their outrageous beliefs that even though you know they’re wrong, they do sound kind of convincing. Chalamet might not have a whole lot of scenes, but he definitely brings this character to life. Lady Bird get a job working at a coffee shop by day / bar by night, where she once saw Kyle’s band play. It’s a stepping stone to learning more about him, and Lady Bird works pretty fast in that area. Kyle comes in for coffee, and they hit it off. Then she realizes that she’ll need to make new friends in order to really get his attention, and so she more or less dumps Julie for Jenna, a popular bad girl, from a rich family. Jenna is so snotty and well-off, that when Lady Bird tells her that the blue house is hers, Jenna says that its in the area where their starter house was. Lady Bird wins Jenna over by pulling a prank on a nun that has gotten under Jenna’s skin, decorating the nun’s car in a unique fashion. And just like that, Lady Bird is in. She starts learning of places she has only heard of and pictured before, (and becoming disappointed, like when she learns that this spot which is supposed to be the coolest place, is actually just a parking lot.) And when she gets invited to one of Jenna’s parties, she finds Kyle out by the pool, keeping to himself. Exactly what you’d expect from this kid. Ans Lady Bird eats it up. 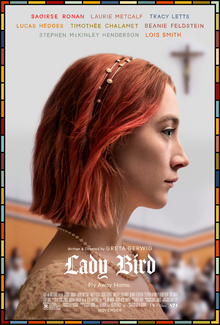 Kyle feeds her a line about him being a virgin, and Lady Bird goes to bed with him, only to learn quickly afterwards that the line was a total lie. While Lady Bird is a movie that exists in two halves with the friends she has and the guys she dates, there’s a story that also runs straight through the entire thing. That’s the story of Lady Bird and her parents. Her father is ever supportive, while her mother is constantly critical. When her mother tells her how much Lady Bird has cost them, Lady Bird tries to write the amount down, saying one day she’ll get a great, high paying job and pay them back. The mother’s response is something along the lines of, “Ha.. you’ll never get a high paying job.” Lines like this are what make this movie a black comedy, (it’s the kind of thing you might expect Royal Tenenbaum to say to one of his kids.) It’s a funny movie with an interesting story. Part of what makes it so special is how many different ideas and storylines this movie has going on all at once. Especially since all of them work.